The three-member National Motorsports Appeals Panel will hear the appeal of Team Penske’s No. 2 Monster Energy NASCAR Cup Series team on April 12, according to a NASCAR.com report. 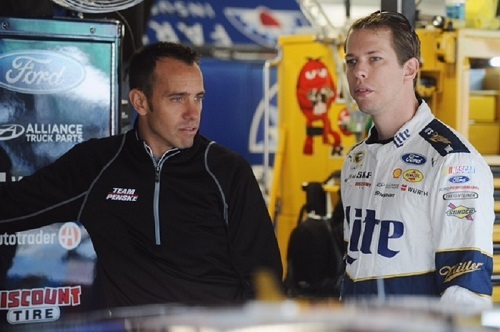 Crew chief Paul Wolfe was suspended for three races and fined $65,000 and driver Brad Keselowski and car owner Roger Penske were docked 35 championship points after the No. car failed post-race inspection after the March 19 race at Phoenix International Raceway. The team didn’t appeal the penalties, at first, and Wolfe already has served one race of his three-race suspension. Brian Wilson was the crew chief for the team the following weekend at Auto Club Speedway in Fontana, Calif., guiding Keselowski to a second-place finish. After the No. 2 team inspected its Phoenix car at its race shop in Mooresville, N.C., it opted to appeal the penalties. The appeal has deferred Wolfe’s suspension, so he was back atop the pit box for the April 2 race at Martinsville (Va.) Speedway. Keselowski won that race. With the appeal not scheduled to be heard until Wednesday, Wolfe also will be the crew chief on-hand for Sunday’s O’Reilly Auto Parts 500 at Texas Motor Speedway near Fort Worth.